Schwalm Embroidery – The Definitive Guide! If you’ve gotten to know me a bit through Needle ‘n Thread, you’ve probably figured out that I like books – and I love needlework books. 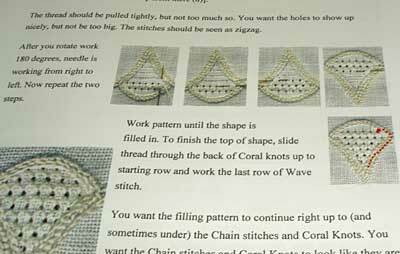 Occasionally, I read a needlework book from cover to cover, but it’s rather a rare thing for me to do, especially if it is a book on a specific needlework technique. In such cases, I “scan” – I look for the information I need. 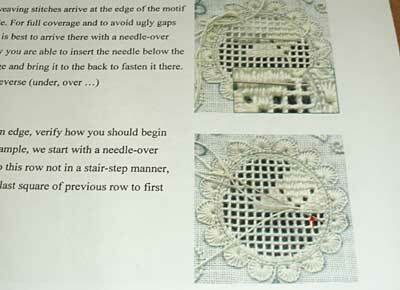 For the first time in a long time, I read a needlework book from cover to cover yesterday. 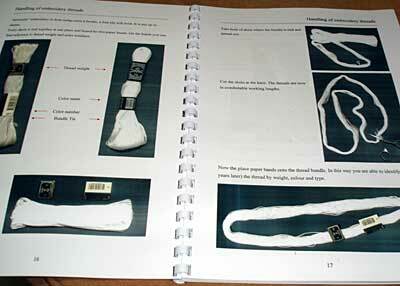 It wasn’t hard to do, as the book is filled with pictures, and the text is made up of clear, succinct instruction. 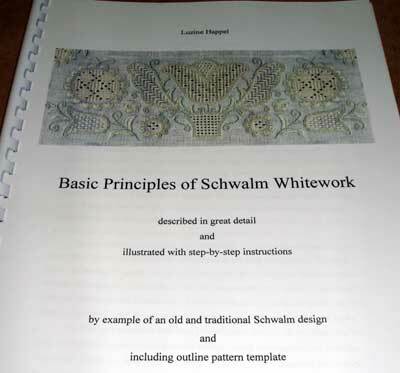 Basic Principles of Schwalm Whitework by Luzine Happel is a self-published book that I think will become the definitive guide to learning Schwalm embroidery. The English version, recently edited by Joey Colbert (who formerly owned a great little embroidery shop called Twining Thread) and with an introduction by her, is one of the best instructional books that I’ve seen focusing on teaching a specific needlework technique. Do not be put off by the fact that this is a self-printed book bound with a plastic comb. I say that because I’ve purchased many such printed books, and some of them have been complete fizzers, even though written and sold by rather well-known names in the needlework world. This book is not a fizzer. The book is printed in color on nice paper, bound with a plastic comb, and has a clear plastic cover. 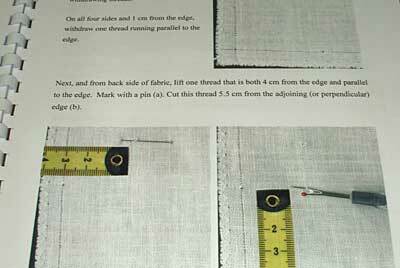 The binding, actually, is an advantage – the book lays flat on the table, which is a boon for stitchers who are following the instructions within. The book is written around one (beautiful!) Schwalm whitework project which incorporates all the major aspects of Schwalm embroidery, including many filling techniques, from simple to intricate. The premise is that, if you work through the project – a small decorative square linen with a Schwalm design around the four sides – you will become familiar with, and practice, all the techniques involved in Schwalm whitework, including excellent finishing techniques. The author takes you through every step of the way and leaves no question unanswered. After beginning with a discussion of materials (fabrics, threads, tools), Luzine shows you, through pictures and text, how to set up your fabric and transfer your project so that you begin on the right foot. 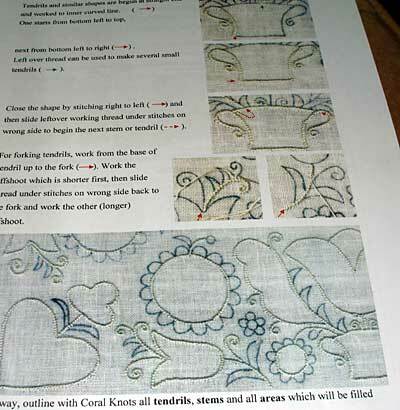 This section alone would be of interest to any stitcher, regardless of technique preferences, because the principles in the set-up of this project apply to setting up practically any embroidery project. 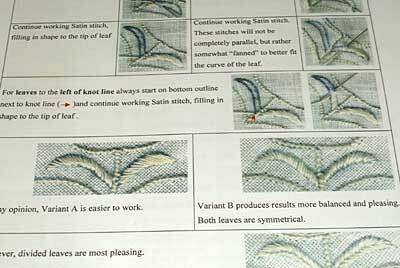 The proper marking of the fabric so that the design is centered and lined up perfectly, the transfer of the pattern, including transferring an extra corner piece – all this information is useful to the hand embroiderer. You can see here a glimpse of the design. On the right page, in the left corner of the design, you can see how the extra motif for the corner is being aligned with the rest of the design. Luzine addresses the question of how to treat your threads – how to arrange them for easy access and in a way that keeps them neat and organized as you work through the project. The stitches are explained with step-by-step photos, but more interestingly, the whole progress of the projects is explained with step-by-step photos, too. Each time you get through a stage of the project, a complete picture of the area is given, so you can see what it’s supposed to look like at the end of that stage. Progressing to the next stage, you’re taken step-by-step through it, and then given a clear picture of what your work should look like at the end of the stage. Since different results are often desired from the same stitch (for example, depending on the shape of the leaf, satin stitches will be worked differently), Luzine includes photos of all the results you will want to achieve, discussing them and explaining how to achieve them. One of the most beautiful aspects of Schwalm whitework is the variety of fillings used inside the various motifs. There are three basic approaches to fillings in Schwalm, and the author explains all three, then takes you through different stitches within the three categories. The project incorporates all different types of fillings, working you from the basic to the more intricate. Close-up photos and detailed explanation take you through what could be tricky ground. This is the aspect of Luzine’s book that I prefer vastly over Christine Bishop’s book, Schwalm Embroidery Techniques and Designs, which I’ve already reviewed. 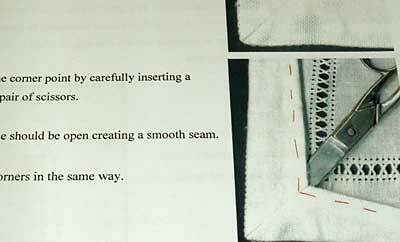 While I like Christine’s book and find it informative and inspiring, when it comes to actual stitch explanations (especially in the filling techniques) and their sketched diagrams, the book leaves the novice stitcher with questions that require troubleshooting. Luzine’s explanations of the filling techniques used in Schwalm are clear, precise, and well illustrated. And, again, as you go, you get the photos of the work as you complete a stage. Now, in many technique books, the finish work is either neglected completely, or, if finishing is discussed, it is in the most generic of terms. Not so in this book. The author takes you through every step of finishing the project. nderstand the principles, you can apply them to a variety of decorative treatments. 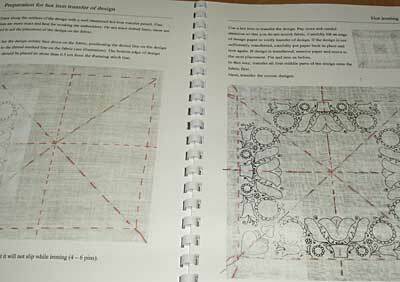 Finally, in the back of the book, you’ll find two semi-transparent pages with clear line drawings of the motifs used in the project. 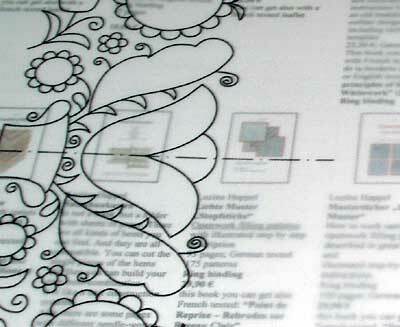 These are marked with dashed lines on the center points, so that you can line up the design precisely on your fabric. Now, the book is available, but it has to be ordered from Germany either directly from Luzine or from the Museum der Schwalm website in Germany, which is rather difficult to order from. This is the direct link to Basic Principles of Schwalm Whitework by Luzine Happel at Museum der Schwalm. Better yet, you can contact Luzine directly for the book and she can send you a Paypal invoice (which is much easier!). Her e-mail is leuchtbergverlag [at] aol [dot] com. The price is a bit daunting, I know, at 29.9 EURO (about $42US). And you might think that, because it isn’t a professionally published book, it couldn’t be worth that. I think it is worth that. If you want to learn Schwalm, or you want to explore it further and learn some of the tips and tricks, I think this is the best book for doing so. There’s just no comparison between it and the other two popular Schwalm books on the market (Christine Bishop’s and Renate Fernau’s). 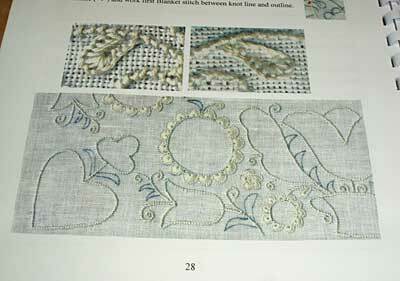 While both of those feature beautiful embroidery – and the sampler in Christine’s book is really nice! – the actual instruction in both books fall short when compared to this book, in my opinion. So, if you’re interested in Schwalm or whitework in general, I think this is a book to add to your library! Since reading it, I’ve decided (ut oh!) that, with the exception of the current long and short stitch stuff I’m preparing for the website, my next “complete” project – as in “real” and “serious” project, is going to be this piece. It’s beautiful. And I want to learn from Luzine!! Don’t be surprised, then, to see me setting up this project in the next few weeks! You have expressed my sentiments exactly, Mary! I love this book! After buying the German edition and finding myself wishing I could read German, I offered to edit this book for Luzine. Oh, Mary! You make me crazy about so many books!!! This is really a temptation! Once more, thanks and thanks to Joey too for giving us Luzine e-mail. I would like to add that I have absolutely no monetary interest in the success of this book and offered my editing services gratis. However, I will admit to being selfishly motivated in wanting an English edition. 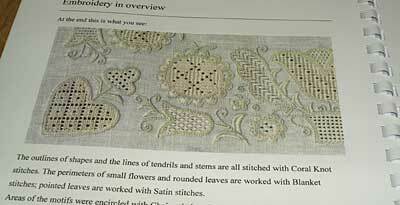 This review, and the book described, makes me want to take up Schwalm embroidery! Good to see a high standard self published book out there – they vary so much, but good ones can be done. Thanks again Mary for a great review — it's on my list to order this book! Thank you so much for the wonderful insight into this book. I'm extremely interested in Schwalm embroidery and pleased to know how to acquire such a publication. Thank you to the lady who gave the email address for it's purchase. Thankyou verymuch for the insight of this book. I am also in the line to know about the book. You really know how to get my mouth watering. I've haven't begun yet – and I'm already hooked! Please sign me up for this tantalizing book! Your giveaways are a great way to keep all of your readers coming back! Oh, this has really inspired me. I can't wait to finish my current project so I can try this. Thanks for the inspiration! Hmmm. So tempting. I am now in my seventies and trying to get rid of stuff, sewing books included but Mary and the rest of you make this sound so appealing. I do happen to have extra money in the Paypal account too, just sitting there. …what shall I do? So many projects on the go, in my head, and promised….. Thanks for the review, I have tried to do some of these stitches after my head injury but could not get them right. Because nanna is gone I have no one to show me again. This would be a great substitute to go by. L Alewine Your emails are great, wish my needle work looked like yours–maybe some day.The book of Schwalm Whitework would be great and would help learn and over come some problems. Another attempt to win something special (I know i will not get 🙁 an attempt :)) and what better than this Schwalm Embriodery book! I like the way you embrioder and bring out the interesting topics. Great work! Keep Sharing! Sharing is caring! Just got introduced to Schwalm embroidery last night when meeting with some friends. I love the look and am keen to get into it. This book looks a perfect one for a beginner aswell as someone more advanced. Hmm, I have a birthday coming up, might make some suggestions! You are a real inspiration to all of us. I plan to buy the book and give it a try. I have a friend who does beautiful Schwalm whitework. Thanks for the review and pictures of this lovely needlework. Iam left -handed. Ilive in Iran and many books are not her!! you make me very happy for these books .thanks Mary. Mary, thank you for sending the link to Luzine’s site. I was delighted to find the historical background. I have been searching for such site. I enjoy Schwalm work, I even took a 2 day workshop with Frau Stuebing many years ago in Schwalm. You made my day. Not in English? …how are you going to correctly follow along? Where can I order the book you reviewed Basic Principles of Schwalm by Luzine Happle? I also want this book please. where and how can I order it. I am interested in purchasing this book and Fancy Hems. My emails are returned as undeliverable. Is there perhaps a new email address for the writer? I would really like to try this. 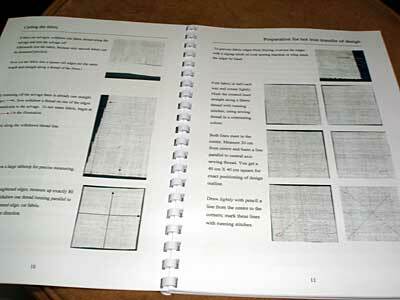 Plus when I start ordering how much thread will I need to do the project outlined in this book? Is there a supplier for the fabric in the US? Thank you for such useful review. I ordered the book. Can’t wait to see it! I was able to buy this book from Traditional Stitches, of Calgary, Alberta. This easy option meant that I could pay in Canadian dollars from a needlework shop whose website I browse often: http://www.traditionalstitches.com.